Home » Global » Bangladeshi garment workers need justice! The struggle for justice and compensation for the Rana Plaza workers is far from over two years after the deadliest disaster in garment industry history. On April 24, 2013, a building housing several factories collapsed outside Dhaka, Bangladesh, killing 1,138 workers, mostly young women, and injuring 2,500 others. It has taken a struggle by injured workers and families of the deceased, union organizers and global allies just to gain some workplace safety measures and a modicum of financial compensation for the victims and relatives. Bangladesh garners $20 billion a year from garment exports. Its 5,000 factories produce millions of garments a year for major U.S. and European retail giants. Worldwide sales enrich global brands such as H&M, Primark, Walmart, The Gap, Mango and Benetton. These companies demand quick, cheap production and low wages for the 4 million, mostly female, workforce. Implementing safety measures cuts into their mega-profits. Some 29 global brands had contracts with Rana Plaza’s manufacturers and bear responsibility, along with local plant owners, for the catastrophe. Blame can also be assigned to Washington, London, Paris, Madrid and Rome for not insisting on safe working conditions in factories producing goods for Western companies. Bangladesh’s government is not blameless either. Its officials notoriously collaborate with local bosses to curb labor costs and suppress union activity so Western corporations can maximize profits. A working-class hero, Animul Islam, organizer for the Bangladesh Center for Workers’ Rights, was tortured and killed in April 2012. No one has been held responsible for his murder. The catastrophe at Rana Plaza unleashed a militant struggle among the country’s apparel workers, who demanded justice for their dead and injured sisters and brothers. This, along with a world outcry, pressed the government to arrest the factory owners and Sohel Rana, owner of the building. They face murder charges. Last summer, the country’s anti-corruption commission also charged Rana and 17 others with construction violations. Even that light charge took a struggle. The continuing, intense class struggle has pushed for workplace safety, higher wages and union rights. 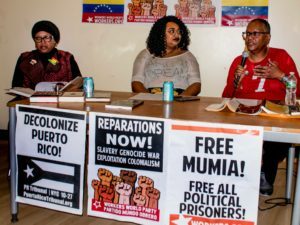 The official monthly minimum pay was increased from $38 to $68 — still a starvation wage, but many companies do not even pay that. Verbal and physical abuse are rampant in the plants, as are forced 14-hour shifts. Garment workers and their advocates in Bangladesh and abroad pushed for the legally binding Bangladesh Fire and Building Safety Agreement. It requires corporations that contract clothing manufacturing there to fund factory safety inspections and upgrades. More than 150 brands signed on — but not Walmart and The Gap, which established a weaker, nonbinding plan. Apparel workers are still dying and being injured by the hundreds in factory fires. Workers and activists in Bangladesh and their allies abroad compelled many Western brands to contribute to the $30 million Rana Plaza Donors’ Trust Fund. However, some retail giants have eluded responsibility and paid nothing, as they are not legally required to support dead workers’ children or unemployed disabled workers. Many of those injured cannot work or are discriminated against and not hired. Some have post-traumatic stress disorder and cannot work. During the two years of waiting for compensation, some died because they could not pay for needed medical care. 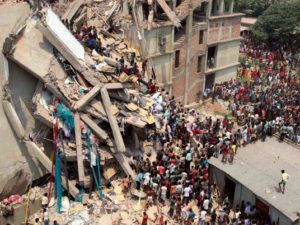 Because some global brands that contracted with Rana Plaza manufacturers have come up short on their contributions, $8 million is still owed to the fund. Mango, Matalan and Inditex will not reveal how much they donated, reported the Clean Clothes Campaign on April 17. It also said that Walmart and The Children’s Place are among companies that underpaid and are being pressed to increase their funding. Because of the shortfall, thousands of disaster survivors and victims’ relatives have received only partial payments. Global solidarity is vital to this cause. After a mass campaign and petition with 1 million signers, Benetton buckled and contributed $1.1 million on April 17, but activists point out the company owes millions more. A campaign is aimed at The Children’s Place, a major contractor of labor at Rana Plaza factories, which paid only $450,000 to the fund. It is being urged to donate $8 million — less than half of CEO Jane Elfers’ 2012 salary. Kalpona Akter, executive director of the Bangladesh Center for Worker Solidarity, and 26 others were arrested for trespassing in March at The Children’s Place in Secaucus, N.J., as they tried to deliver a letter to officers. All charges were subsequently lowered and/or dismissed. These activists ask consumers to pressure the retailer to fully meet its trust fund obligations. 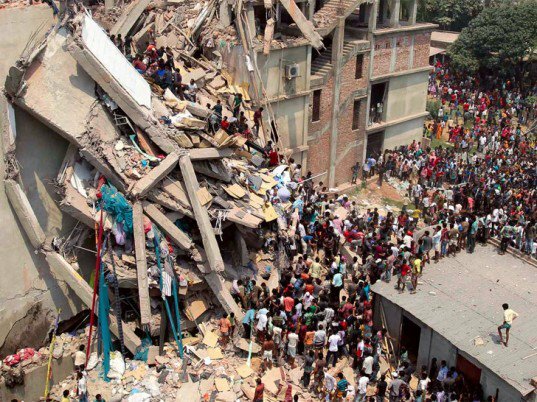 Global actions from April 18 to 24 call for all brands doing business in Bangladesh to sign the safety accord and for companies owing compensation funds to Rana Plaza victims and relatives to pay in full. Bangladeshi bosses and the biggest corporations cannot stop the workers from demanding their rights and gaining support from others. The class struggle continues. Some strong unionization drives are succeeding, while others are still pushing for legal recognition. Moreover, the bosses cannot prevent Bangladeshi workers from gaining international allies. Our Bangladeshi sisters and brothers request and need global solidarity. They ask activists to keep the pressure on the retail giants. Let us show solidarity by demanding full compensation for all Rana Plaza victims and survivors from culpable U.S. companies. 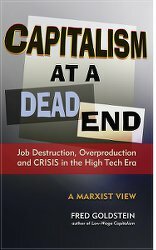 Global corporations sweep the earth searching for the cheapest labor in their “race to the bottom.” They disregard workers’ safety and lives; their only goal is to maximize profits. Their greed has no limits. If workers are injured or die in industrial accidents, they are replaceable, their lives expendable. This is the mindset of corporate owners and CEOs. Brutal, low-wage capitalism is not a policy. 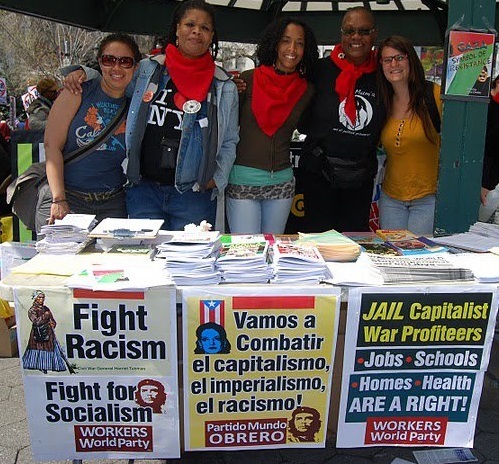 It is the essence of capitalist globalization, of imperialism; it is what creates mega-profits. For the sake of our Bangladeshi sisters and brothers, let us oppose the whole rotten system.